Once you have invested in a swimming pool installation, you will need to become familiar with the requirements for seasonal pool maintenance in Salt Lake City . 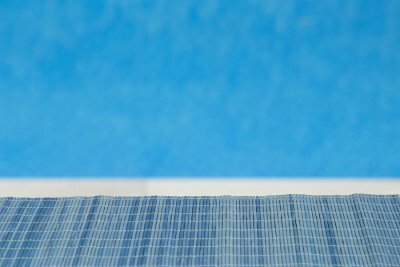 Without regular swimming pool maintenance, your in-ground pool or saltwater pool may become unsafe to use. Here is a seasonal guide to pool maintenance that will help you schedule swimming pool services with your swimming pool company. In order to keep your in-ground pool clean and healthy, you must perform regular, routine swimming pool maintenance throughout the year. You should skim the surface of your in-ground pool every few days to remove bugs, leaves, and debris. Clean out strainer baskets and filters and vacuum your pool once a week. You should also brush the walls and pool tile with a soft brush to minimize calcium deposits and algae buildup. 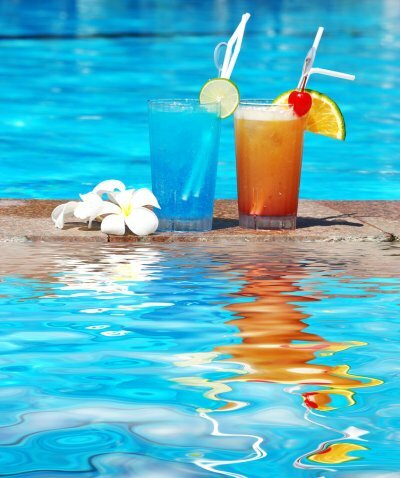 You must check the water level of your in-ground pool regularly, and test and maintain the levels of pool chemicals. You should also inspect and maintain your pool heater. As the weather becomes warmer in the spring, you will want to open your in-ground pool for use. If you use a winter pool cover, you will need to drain it with a submersible pump and remove it from the in-ground pool. Use a hose to raise the pool’s water level, and then reconnect your pool’s heater, filter, and pump. Clear antifreeze from the drain lines, and remove winterizing plugs from the skimmer. Turn pool equipment back on, and test your pool water’s chemistry. Add chemicals as needed, and continue pool maintenance throughout the summer to prevent algae growth, calcification, and unsanitary water. Because most people use their in-ground pools and saltwater pools less frequently in the fall, you will only need to test chemical levels about once a week. When it is time to close your pool for the fall or winter, you must properly winterize and chemically treat the pool before placing the winter pool cover on. A swimming pool maintenance company can assist you in winterizing and closing your in-ground pool. 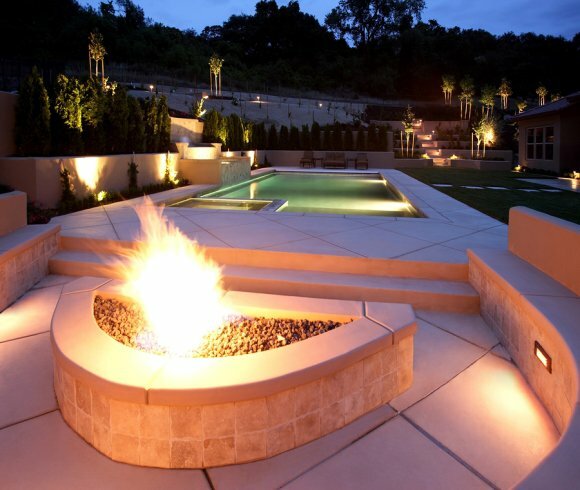 Adding a fire element to your backyard can add beauty and interest to your pool area. Outdoor fire pits and outdoor fireplace in Salt Lake City are popular choices for families who want to enjoy their backyard year-round instead of only during the summer months. Outdoor fire elements provide light, warmth and functionality to your deck or yard. Outdoor kitchens, ovens, and barbecues make it easy to spend more of your family time outside where you can cook and relax together. These fire elements are a great option if you enjoy being in your yard as much as possible, or if you frequently host backyard get-togethers. Deep Blue Pools and Spas serves the Salt Lake City area as a hot tub installation provider and pool contractor. We’ve been in business for over 15 years and are proud to be an A rated company by the Better Business Bureau. The professionals at Deep Blue Pools and Spas can help you plan your backyard pool and hot tub installation. In-ground pools near Salt Lake City are attractive backyard features that can provide your household with a lot of fun, exercise, and a way to cool off during the summer months. If you think you and your family could benefit from a swimming pool, it’s important to think through the process before making any decisions or investments. By knowing what to expect from pool installation and creating a checklist, you’ll be better able to design a pool that’s perfect for your yard and budget. Begin planning for your new pool installation by talking to friends and neighbors who already own a pool. Ask them for suggestions and ideas, and about features they wish they had invested in or ones that they paid for but never use. Learn how long the process took for their new pool to be installed and running, and if they faced any unexpected costs, problems, or pool maintenance issues. Research online and in home and garden magazines to find pictures of pools and backyard designs that appeal to you. This will help you come up with ideas and see what has worked for others. Collect at least a dozen pictures that include elements you like and compare them to determine what designs you enjoy the most. Now that you have some ideas, you can begin to narrow your choices and select what will work best for your need and your backyard space. Make a list of the pool features that you don’t want to pass up and then work backward to cross off anything that will put you over your budget. Many pools are big and will occupy a significant portion of your yard. Before heading to a swimming pool company, use a garden hose or other cord to lay out the shapes that you are considering. Laying out the pool’s potential shape will give you a better idea of how much space will be left to border your pool and the right square footage for getting a quote.